Membership – Amazing New Price! Fantastic New Prices for Membership! Standard Membership. $14.95 USD / £9.95 UKP yearly. See below for the back story and to find out how I'll be making sure that existing members don't loose out! With the support of my many fantastic subscribers I have pulled through the last couple of difficult years. Thank you all! The number of visitors to the site has continued to grow as have the number of subscribers. It's now time to take a gamble. I really enjoy what I do. The idea that I can design a project one day and the next day someone in Venezuela or India or Canada can be building it is thrilling! Inevitably the price of the subscription is a barrier, one that I want to keep as low as possible. So we come to today's announcement. I'm reducing the prices so that as many people as possible can become members. It was difficult when I raised the prices on the website and I know that I lost some subscribers in the transition. Dropping the prices again has needed just as much thought and discussion. It is the members who joined in the last year at the higher rate that kept me and my family afloat. Thank you all! I want to show these members how much I appreciate their support so I have set up some rewards in appreciation. 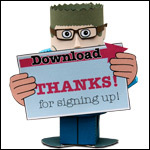 This will give you free access to all the downloads on the site. As a thank you for your support Membership+ members can have lifetime access to membership+ privileges for only £9.95/$14.95 a year! I'll also send you a gift voucher for a standard membership that you can give to a friend. Thank you! It'll take me a little while to get these into place so please bear with me. RE-signing up the minute it's ready!!! >>> Great new pricing concept! Very fair and thoughtful of you. And now I can play with the great things you create more freely without hesitation. I love that you are driven by quality and fairness … this is a good call Mr Ives. machina eX <3 Rob and bows before his honesty and transparency. Wow. Rob Ives: a very nice chap, fair and generous to a fault. Rob, YOU ROCK PAPER AND SCISSORS! WOO-HOO!!! I am very confident that your transparency will pay off. Thanks, Rob. Will absolutely be renewing my membership.